View More In Wine & Champagne Glasses. 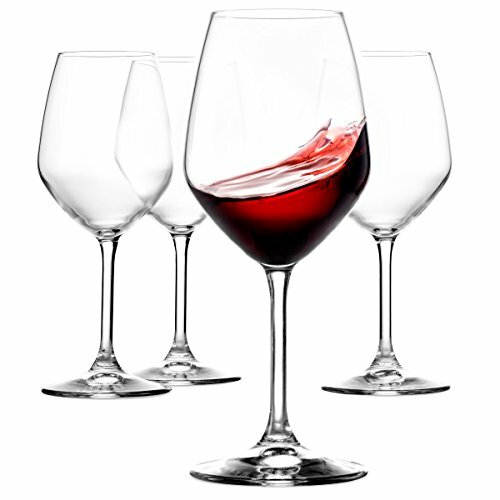 Made in Italy, this exquisite 8 piece, 18 oz wine glass set feature luxurious and luminous Italian-crafted glass that's sure to turn heads, add beauty to your bar top, and make the perfect Christmas, birthday, anniversary, or any special occasion gift. The laser cut glass process delivers uniform and thin rims on the large red wine glasses, enhancing the perceived quality and flavor of any red wine. This large wine glass has a stout bulb shape that feels natural and comfortable when cradled in the hand while also allowing the red wine to breathe enhancing its flavors and releasing its decadent aromas. The dishwasher safe burgundy wine glass set is finished in the premier XLT Treatment; an innovative technology that reinforces the pinot noir wine glasses' stem resistance against the most common causes of breakage. If you have any questions about this product by Paksh Novelty, contact us by completing and submitting the form below. If you are looking for a specif part number, please include it with your message.